Never forget: Western was ahead 40-19 in the Yates Cup. Shelby Blackley was on-site for (these are working titles) what could either be called the Michaels Miracle after Laurier's head coach and quarterback, or the Great Mustang Meltdown. If you are clicking here, you likely know that the Golden Hawks forged one of those only-in-Canadian-football comebacks in the Yates Cup, upending Western 43-40 with three touchdowns in the final 8½ minutes left and a last-play field goal by Nathan Mesher. The against-almost-all-probabilities rally sets up a Laurier-Laval Uteck Bowl next week in Ste-Foy, Que., while Calgary will host St. Francis Xavier in the Mitchell Bowl. For nearly 50 minutes, it went as many neutral (hah!) observers had anticipated/feared. With 10:14 left, Western led by 21 points. Laurier coach Michael Faulds used a timeout before a third-and-five play. Obviously, quarterback Michael Knevel converted that do-or-done play. Laurier led OUA in third-down conversions (58 per cent) during the regular season. They went 4-of-4 down the stretch, even though the average yards to go was 8.25. Brentyn Hall caught a 29-yard touchdown on third-and-18 for the first touchdown. Knevel scrambled to convert a third-and-4 on the drive that pulled Laurier to 40-33. The reverse! Western is power, power, power all day, apparently until it matters most. With 1:36 left and second-and-six on their 27. Coach Greg Marshall's Mustangs called a handoff to Alex Taylor with slotback Myles Rombough looping for a reverse pitch. Any play with multiple handoffs is risky at the best of times, never mind when it is tight-sphincter time and the opponent has momentum and a feeling of nothing to lose. Hawks DB Isaiah Guzylak-Messam stripped the ball from Taylor as he was trying to pitch it and made a fumble return to Western's three-yard line. On the next play, Knevel threw a teardrop back-shoulder fade to Kurleigh Gittens Jr. for a tying touchdown. Western, working against the wind, did not pass on their last possession and went two-and-out. Laurier took over on the 52-yard line with 47 seconds left. Levondre Gordon scooted for a 31-yard rush to get into Mesher's range. Perhaps the worst thing that could have happened to Western, other than the fumble and the breakdown in punt coverage and run support, was having a one-play touchdown drive in the fourth quarter. Wide receiver Harry McMaster broke free for a 61-yard pass-and-run touchdown to open the 21-point lead. 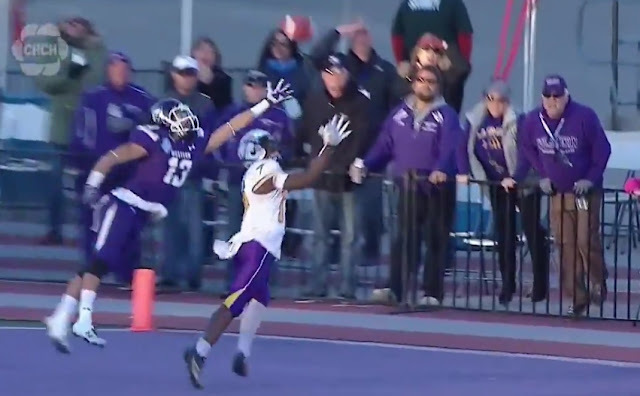 If they had pieced together an eight- or 10-play drive, Laurier might not have had enough time to rally. There is a parallel with the 2005 Laurier team. In that 2005 Vanier Cup, Laurier made a two-score comeback to defeat Saskatchewan 24-23. The Huskies also had a long touchdown when chewing clock, with running back David Stevens housing an 85-yard run. Instead of having to go to hurry-up mode, Ryan Pyear was able to run the base offense to answer the touchdown. To think someone was concerned about Laurier holding up in the rushing phase without Eric Guiltinan, who was injured in the first quarter of the semifinal against McMaster. Levondre Gordon had 205 rushing-receiving yards on 19 touches, including a 43-yard TD in the first half. Faulds had never defeated Western since taking over as Laurier's head coach in 2013. This was, numerologists take note, his seventh time coaching against Marshall. Something I overlooked: Knevel, who had never played in OUA before this season, had only two interceptions during the regular season. Merchant was picked off five times in the last four regular-season games. On Saturday, Knevel was pick-free. Merchant threw one to Godfrey Onyeka that led to seven points the other way. Backup QB Stevenson Bone still had his knee on the ground when he lateraled to kicker Marc Liegghio, killing the play. Credit the officials for being on the spot. Laurier recently marking the silver anniversary of its 1991 national title. That team also won the Yates Cup on Western's field. It also made a three-touchdown postseason comeback, against Queen's in the national semifinal. Each of Western's losses this season involved allowing 24 unanswered points. Against Carleton, it was to start to the game; against Laurier, it ended the game (and season). Coincidence: Michael Faulds' last game as a player was the 2009 Yates and his first as a head coach is the 109th. Each time, the winning team scored 43 points. Mesher was 5-of-5 on field goals. He made only five in the regular season. Laurier's last Vanier Cup victory came in Hamilton, where the game will be played on Nov. 26. That 2005 team didn't have to contend with Laval; they played Acadia while the Rouge et Or lost a two-pointer to Saskatchewan in the Mitchell. As hard as it is to believe, Western has lost three of the last four Yates games it has hosted. The great debate: did this game supplant the Faulds-Danny Brannagan shootout in 2009, which Queen's won by a nearly identical 43-39 score? The '09 game was the rare instance of a matchup that validated the hype. However, Queen's was at home and was 4-1 against Western over the previous four years, including two blowouts. The form suggested they would win. In contrast, Laurier has galvanized in the second half of the year after having quarterback problems at the outset. They had not defeated Western during the Faulds era, losing by 19, 14, 50 (! ), 15, 41 and 21 points. That is an average of 26.7 points. This was less anticipated and sports is better when it can still surprise us.